Whose fault is it if a customer does not approve of a company’s energy-savings insulation proposal? Does the customer seem not to understand it? Or is it that he or she cannot get senior management to take a serious look at it? Could it be the insulation contractor’s fault for not helping the customer fully appreciate the solid economic value of the project he or she needs—and really wants? Everyone knows there is no such thing as a free estimate. Proposals and estimates require time and money to prepare. The trick is to avoid the mental trap of not investing enough in the next proposal because of subconsciously expecting close ratio of only 20 percent. Understanding the big picture of cost-reduction proposals might provide the motivation to spend a little more time on that next proposal. The truth is, a little more time and a higher level financial analysis could dramatically increase the close ratio, increase sales, make the insulation contractor’s time more productive, and put some energy back into the sales process. Selling a cost-reduction project like an insulation energy management plan requires new tools for the sales executive. Books and seminars have been written on how to sell to VITOs (very important top officers), as well as selling at the “C” level within the customer organization. Maybe a contractor’s proposals contain the traditional elements and technical data, but those very items could be why the close ratio is low. Technical jargon and reams of specifications and engineering calculations may be of great interest to plant engineers, but they will bore a chief financial officer (CFO). Generally, CFOs are only interested in the investment aspects of a proposal; they assume their company’s plant management previously addressed the technical points. Simple payback is no longer the primary tool in the financial analysis toolbox. Consider why it is called “simple” payback. A proposed project’s value is likely to be greater than the energy savings alone. It represents permanent improvements in the customer’s cash flow. The time value of money and the increase in positive cash flow are hot items to customers. An insulation contractor’s sales toolbox needs to include the financial impact of secondary benefits, life-cycle costing, return on investment (ROI), net present value (NPV), and asset appreciation. Before using these tools, though, contractors should first make sure that all the benefits the project will produce are accounted for (as line items). Slight improvements in plant productivity and product quality may be more important than selling just the benefits of the pure energy cost reduction. The conservative value of improved productivity, improved product quality, reduction in product losses or returns, and reduction in production downtime should be considered. Plant management needs to provide—or at least support—the financial value of any added (no energy savings) benefits. Customers need to perform a cost-benefit analysis of any proposed capital investment. The key word is, of course, “investment,” since a properly engineered insulation proposal is an investment and not an expense. This concept is the same whether the customer places the investment under the operating budget or the capital budget. Simple payback is a measure of the time it takes to recover capital spent on an investment. For example, if a $100,000 machine reduces factory production costs by $25,000 a month, the payback period for investing in the machine is four months. As a basic measure of investment attractiveness, the payback period tends to be most compelling when the period is relatively short. A payback rule is a policy to make a capital expenditure only when the payback period is less than or equal to some period, such as one year. 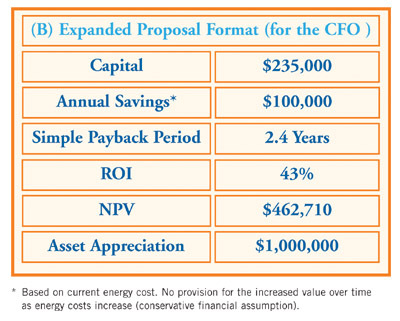 Simple payback period does not reflect the value of the cost savings over time. Some people fail to understand that the savings from an insulation project represents permanent savings and an effective lifetime of X years. ROI is a variation on simple payback period (one where the investment capital spent is divided by the payback in years) that provides the annual return from the investment. 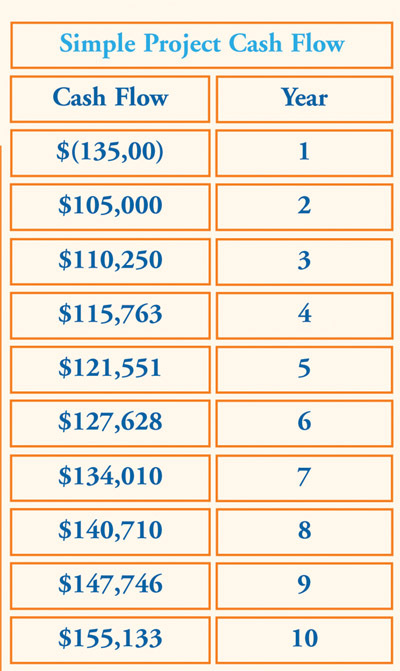 This is similar to the interest rate earned by a savings account. ROI by the payback period ignores the time value of money. NPV is a method for evaluating the profitability of an investment or project. The NPV of an investment is the present (discounted) value of cash inflows minus the present value of cash outflows. Here is an example of NPV. Suppose an investment requires an initial cash outflow of $5,000 and provides cash inflows of $4,000 in year 1 and $3,000 in year 2. Without using NPV, the cash flows simply total $2,000. By recognizing the time value of money and equating dollars from different years, NPV makes it possible to evaluate long-term investments. Accurately estimating the cash inflows and outflows for the NPV calculation is tricky; selecting an appropriate discount rate for NPV is also difficult. Nevertheless, NPV is a valuable tool for analyzing capital projects and other investments. As the Popeye character Wimpy often said, “I’d gladly pay you Tuesday for a hamburger today.” Much like Wimpy, CFOs would rather pay you in the future than pay you 100 percent today. Capital budgeting tools like NPV compare the value of investing in an insulation project against the value of investing the funds in some other venture. The other unnamed venture produces an ROI that the insulation project needs to beat (the so-called hurdle rate). The bottom line: If the company believes it can get a 15-percent ROI for its money on another venture, then the insulation project must beat that ROI to be considered. 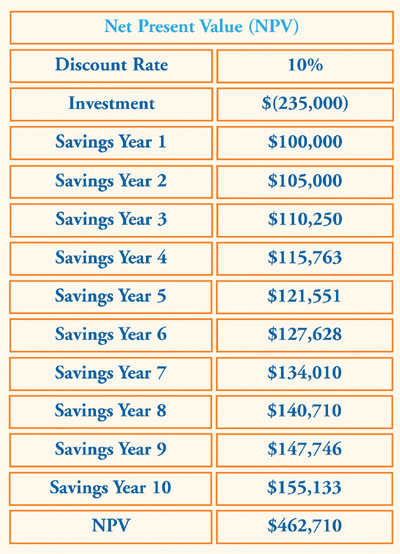 Cash investments generally occur at the beginning (year 0), while project savings occur in a future period. The NPV calculation discounts the future cash flow since the company does not have it today. If the NPV from the insulation project is $1 or more, it beats the hurdle rate and should be considered. While the length of the analysis may vary from company to company, the NPV basics do not change. Therefore, it is helpful to learn the NPV “discount rate” before preparing the financial analysis of a proposal. NPV can be run using Excel, which also can be used to represent the expected cash flow in charts that make cash flow from various sources (utility savings and other economic benefits) easy to visualize. Many commercial owners are interested in any project that improves profitability. Reduced operating expenses equal better operating profit. The most interesting aspect of this improvement in the bottom line is that this cash flow is worth several times its actual amount to the business. 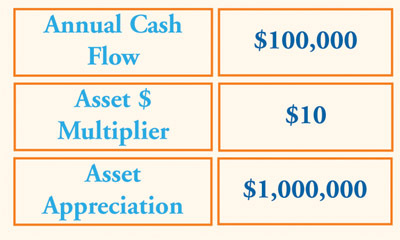 An extra $100,000 in cash flow could be worth 10 times that amount—or $1 million—to the value of the asset. This is a hot button with a number of owners. Using tools like these and writing in the language of CFOs, insulation contractors can give customers the information they need to better understand the financial aspects of their insulation proposals. Instead of having to process unfamiliar terms like British thermal units (Btus) saved per year, CFOs can relate to the project as to any other capital investment. The insulation project now can be connected to the cost per ton of product the company manufactures. Suddenly, the project can relate to a public company’s dividends. As a CFO, which version of the insulation proposal on this page and page 44 would draw the most attention—and serious consideration for funding? In a real insulation project, the numbers obviously will be much higher—and, therefore, more important—to the CFO or other top officer looking at the value of an insulation project over time. The U.S. EPA/DOE EnergyStar program’s free Financial Value Calculator (www.energystar.gov/ia/business/financial_value_calculator.xls) converts the savings and improved cash flow into the impact on the company dividend. With a little extra effort, a CFO-class insulation “investment proposal” should get the customer’s attention and move quickly into the corporate finance department for a capital investment review. If the numbers are good, conservative, and supported by middle management, an insulation contractor’s chances of success are quite good.